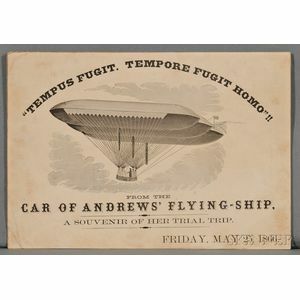 Airships, Ephemera, From the Car of Andrews' Flying-Ship, a Souvenir of her Trial Trip, 25 May 1866. Advertising flyer, printed on mid-weight stock, with the slogan: Tempus Fugit. Tempore Fugit Homo!! printed in an arc at the top, a large wood engraving of the aircraft beneath, slightly browned, 9 3/4 x 6 3/4. 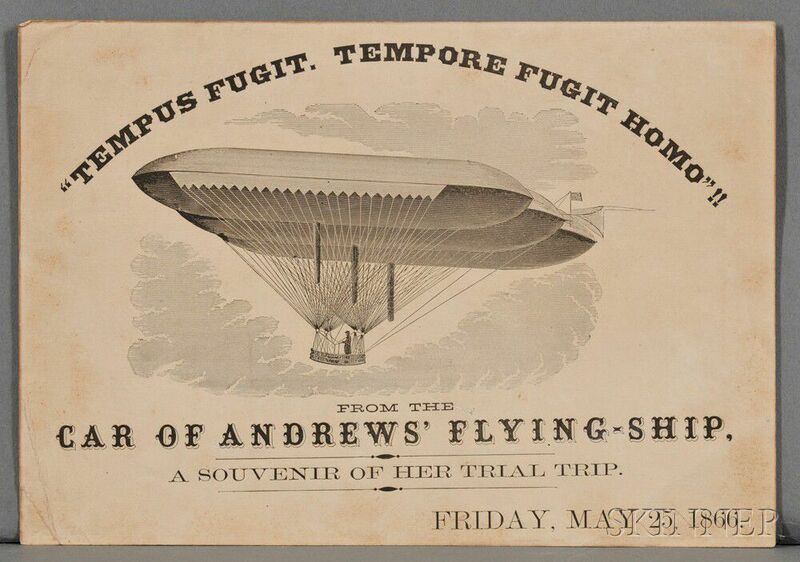 Dr. Solomon Andrews (1806-1872) of Perth Amboy, New Jersey, flew his dirigible, the Aereon, up Fifth Avenue in New York City for the first time on May 25, 1866. He threw these cards down to the onlookers below.